This is a 20″ Diameter by 30″ long smoker with a 20″ by 20″ Square Firebox. Air-cooled stainless steel handles, & an easy to read 3″ dial stainless thermometer. Additional storage space underneath with a 20″ by 30″ long log rack. The main cooking area has a two piece meat rack framed in steel angles for strength and a removable half shelf. The firebox also features a top open lid with adjustable grilling heights in the firebox. 20″ by 20″ square Firebox has a removable 20 pound ash-pan with curved lip for easy ash-clean-out, & sliding air intake shield. 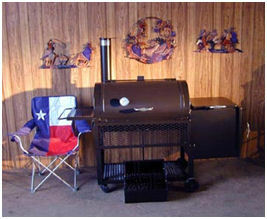 Stainless Steel Meat Rack & Fire Rack in Firebox $250.00 ea.